The Hult Prize is the world’s largest student competition for budding social entrepreneurs and every year, welcomes college and university students from all around the globe. From more than 50,000 applications received every year, one winning team will receive USD 1 million in seed capital, as well as mentorship and advice from the international business community. RNI is honoured to be the official host of the Hult Prize at UofT again this year. Visit the HP @UofT website to learn more about the competition and to register your team. In partnership with the United Nations, the Hult Prize Foundation hosts college and university events around the world in search of the next game-changing start-up. 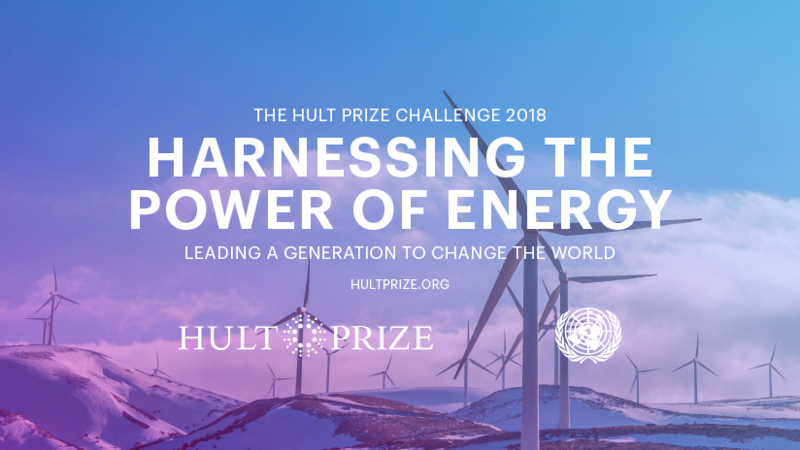 The annual Hult Prize awards one million dollars in start-up funding to the team of students that develops the most radical and breakthrough idea to solve one of our world’s toughest social challenges. The winner of the intra-campus event will automatically advance to compete in one of fifteen regional finals happening around the world next March. One winning team from each host city will then move onto a summer business incubator, where participants will receive mentorship, advisory and strategic planning as they create prototypes and set-up to launch their new social business. A final round of competition will be hosted in September 2018, where the winning team to be awarded the $1,000,000 prize. For the fourth year in a row, a special quarterfinal qualifying round will be held for the Hult Prize at the Rotman School on December 2. This year’s challenge focuses on harnessing the power of energy through one of six dimensions: food, water, mobility, connectivity, education, and health. Shonakshi Chaubal, MBA’18, will be leading the Hult Prize at the University of Toronto initiative, and is confident that her peers on campus have as good as chance as anyone to go all the way with this year’s Hult Prize. UofT has a reputation for excellence at the Hult Prize regionals. In the 2015 competition, Team Attollo, composed of MBA students and alumni from UofT’s Rotman School of the Management, reached the global final. The 2016 challenge saw four UofT teams reach the regional finals held in Dubai, San Francisco, London UK and Shanghai. Last year, three UofT teams advanced to regionals, with two of those teams composed of Rotman students. The Hult Prize@UofT is made possible each year through the support and sponsorship of Rotman Net Impact. Rotman Net Impact is the principal student club at Rotman dedicated to sustainability, and has been supporting the Hult Prize @ UofT for over 4 years. To learn more,visit the HP @UofT website or contact shonakshi.chaubal18@rotman.utoronto.ca.